Other solutions available at the time didn’t suit our needs. Solutions we considered included Chronos which lacked the features we needed and required a Mesos cluster, Spotify Luigi and Airbnb Airflow, which was immature at the time. At the time, we chose ECS because we hoped to take advantages of AWS features such as autoscaling in order to save costs by scaling the cluster up and down by demand. In practice, this required too much manual effort and moving parts so we lived with a long running cluster scaled to handle peak load. Since then, our needs have grown and we have jobs ranging in size from a couple of hundred MB of memory to 60GB of memory. Having a cluster scaled to handle peak load with all these job sizes had become too expensive. Most job failure noise has been due to cluster resources not being available or smaller jobs taking up space on instances meant to be dedicated to bigger jobs. (ECS is weak when it comes to task placement strategies). Thankfully AWS have come along with their own enhancements on top of ECS in the form of AWS Batch. Managed compute environment. This means AWS handles scaling up and down the cluster in response to workload. Needing a custom AMI to configure extra disk space on the instances. Make disk space on managed instances configurable. Currently the workaround is to create a custom AMI with the disk space you need if you have jobs that store a lot of data on disk (Not uncommon in a data processing environment). HBC Tech has a feature request open with Amazon on this issue. Why not dump Sundial in favour of using Batch directly? Easy transition, processes can be a mixed workload of jobs running on ECS and Batch. Configurable backoff strategy for job retries. Sure enough, some of the above can be configured through hooking up lambdas/SNS messages etc. but Sundial gives it to you out of the box. 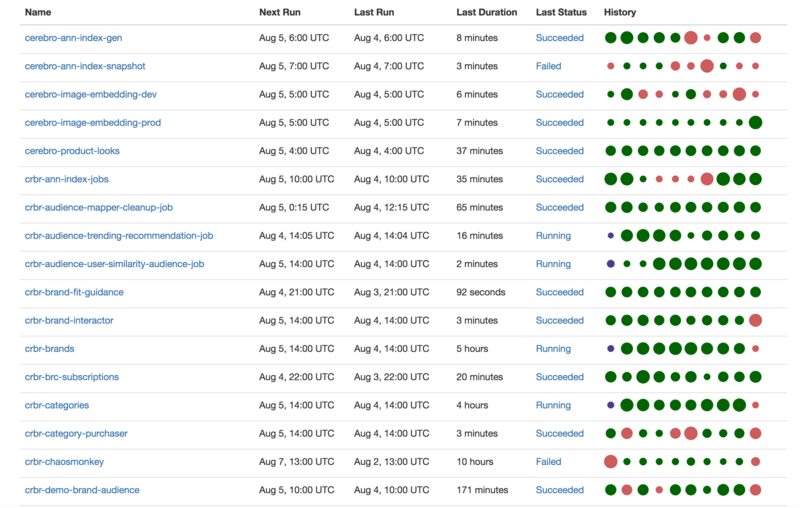 Sundial with AWS Batch backend now works great for the use cases we encounter doing personalization. We may consider enhancements such as Prometheus push gateway integration (to replace the Graphite service we had with ECS and to keep track of metrics over time) and UI enhancements to Sundial. In the long term we may consider other open source solutions as maintaining a job system counts as technical debt that is a distraction from product focused tasks. The HBC data team, who have very similar requirements to us, have started adopting Airflow (by Airbnb). As part of their adoption, they have contributed to an open source effort to make Airflow support Batch as a backend: https://github.com/gilt/incubator-airflow/tree/aws_batch. If it works well, this is a solution we may adopt in the future.